Self Build pools are where the Client acts as Project Manager and lets sub-contracts to several Trade Contractors - although many Clients muck in an do quite a lot of the work! If you are planning to Self-Build an indoor or outdoor swimming pool, Bluepools can assist and advise you throughout the Design and Installation of Your Swimming Pool Project. The way it works is that Bluepools becomes your Pool Consultant so that the expertise of a Pool Installation Contractor is not required. It is much easier to Self-Build the pool when you have a comprehensive set of Design Drawings and the Specification that Bluepools produces for every project - and the risk of getting something badly wrong is eliminated. Bluepools also provides all the pool equipment from top quality suppliers so that the pool Self-Builder does not have to worry about the nitty - gritty of making sure that all the parts fit together properly and pool installation is not delayed because some vital part has not been ordered. 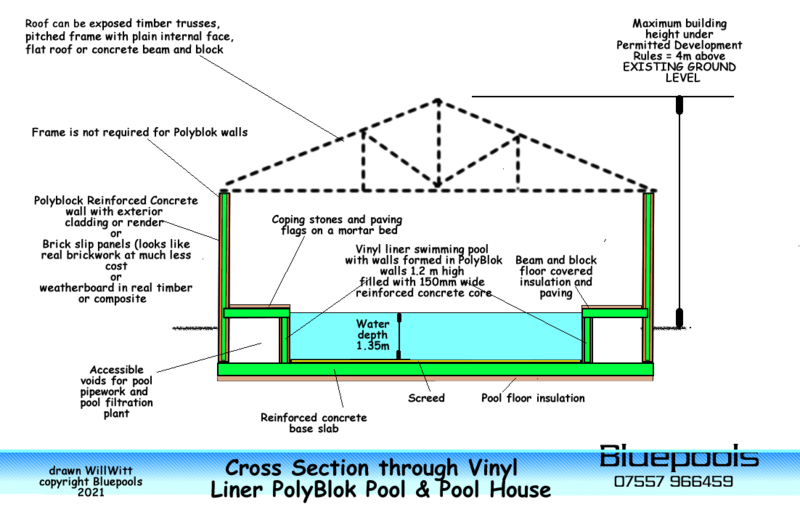 Bluepools also provide a comprehensive installation manual and will be on Skype or on the telephone or email providing advice and guidance to the Self Builder and/or his sub-contractors from Concept to Completion throughout the working week. An outdoor pool does not even require Building Regulation approval - but an indoor pool does. A word of warning about indoor pool design by an Architect. They always design the pool hall with conventional deep strip foundations and then show the pool with its own seperate foundation. As a result all the pool fittings and pipework is buried in the soil between the swimming pool and the pool hall foundations. If there is a leak from any of these fittings your expensive pool hall floor will have to be dug up!!! Futhermore the ductwork that is required to provide warm dry air to the pool hall glazing has to provided in ugly overhead ductwork because it is very difficult to protect buried ductwork from rust and corrosion. The best way to build an indoor pool is to have the pool hall floor at about 150mm above general ground level so that the pool tank and pool plant rooms are below ground. This is the best design from the aesthetic and usability points of view but is will cost quit a lot more because substantial volumes of soil have to be carted off-site and the basement (below ground areas) need to be structurally robust, insulated and provided with land drainage systems. The more economic option is to have most of the pool tank above ground with the pool plant room also above ground. The headroom over the pool is also limited to just over a metre adjacent to the pool hall walls and access to the pool is provided by steps. The total cost of an indoor pool hall and pool is also very dependent on the area of glazing and the quality of the interior and exterior finishes to the pool hall and roof. Bluepools always strives to provide all the requirements that its Client has and so we examine all the Options and provide Cost Estimates so that you can match your requirements to your budget. The Process described below is set up with this objective in mind and is basically the same whether for Indoor or Outdoor Self Build pools. ☻ Bluepools visits the site for a Site Meeting with the Client to identify the detailed requirements, and takes the necessary measurements, photographs and utility location details. ☻ Bluepools considers the requirement and develops outline 3D sketches and pool plans ands emails these to the Client for comment. ☻ Client obtains quotes from Trade Contractors for the supply of building materials, the pool hall construction, the pool installation and the installation of the pool equipment. ☻ The Self-Builder / Trade Contractors install the pool and Bluepools provides the pool equipment and a "Help Desk Service"
Bluepools provides this service on the basis that the order for the supply all the equipment including liner, cover, air source heat pump and mechanical ventilation, and all the other specialised pool equipment is placed with Bluepools Ltd.
☻ The actual purchase of the equipment requires a lot of background knowledge and experience - especially for things like liners. And if the liner, plumbing or electrical parts do not fit there will be costly site delays when parts have to be re-ordered. ☻ Bluepools advises the pool Self-Builder impartially on the advantages and disadvantages of each product from the point of view of cost, efficiency and expected life. ☻ There is a simple division of responsibility - the Self Builder is responsible for all the building and installation work and Bluepools is responsible for the Specification and capacity of the Pool Equipment. The Method described above will provide a reliable budget for the total cost of the pool installation before the Client is committed to the Project and eliminates the Risk involved in paying a Pool Installation Contractor up to 25% of the Total Pool Cost before he even starts on site. The Bluepools Fee for STAGE 1 is normally £1200 + VAT and is due before STAGE 1 commences.